Summary 0002690: The new versions battleye anticheat breaks the functionality speedfan. Description The new versions battleye anticheat (battleye.com) breaks the functionality speedfan. 3. Speedfan stops working until the next reboot. good day, I have the same problem, is there any solution? I ve the same pb with pubg other is uninstalling/reinstalling speedfan in the running session will restart speedfan properly so I guess its the speedfan service which has an issue. it's not Speedfan's but Battley fault. Can you please contact battleye and come up with a solution? Thanks. I opened a ticket with them as well. I don't expect a reply. Was hoping almico could contact battleye directly. It would likely require direct cooperation to fix this. I am not optimistic. Hopefully battleye gets sued by somebody who overcooks their CPU/GPU when speedfan falls over. I wish he would have at least released the source code to github or something before abandoning it. Battleye is working with so called minifilters and block certain functions to eleminate possible cheating. In this case it is blocking functions which are able to read and write direct to your memory. 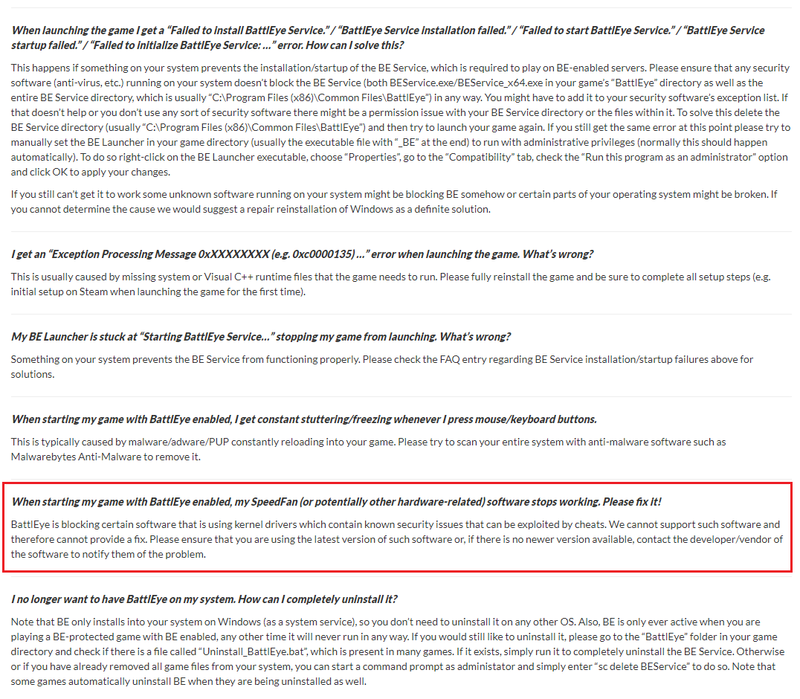 This breaks the functionality of speedfan and its driver as soon as the battleye minfilter driver - BEDaisy.sys, you will not find it on your system because it is hiding itself - is getting started. Battleye is saying the speedfan driver it is not allowed anymore to write information into the memory. At this point the fans will run at the same speed without getting auto controlled anymore. Was the system on low stress and therefore the fans where running slow they will run slow even on stress resulting in - possibly - overheating components and therefore reducing lifespan of your components. Battleye could solve this issue by sending the speedfan driver the information that it is allowed again to write information to the memory while battleye unloads its minifilter driver. Instead it just unloads the minfilter driver without doing this. The user is forced to manually restart the speedfan driver. You could say Battleye is fighting a war against cheaters with the the scorched-earth policy. At least it does look like this. To restart the speedfan driver you need to take the way via the device manager. In the device manager you need to click on "View" and "Show hidden devices". Now you will find these hidden devices called "Non Plug and Play Drivers". In this list you will find the Speedfan driver. Double click on it and click on the tab "Driver". Now you are able to stop the driver and restart it again. You can restart Speedfan and it will work again. Additionally you can write a batch file to close Speedfan, stop the speedfan driver, start the speedfan driver again an start Speedfan for both versions of it to save time. Sorry for any typo or grammatical errors. English is not my nativ language. I hope this will help anybody who is searching for a solution. Thx very much to have shown us how to restart it ! I will check on how to batch this procedure! start "speedfan" "C:\Program Files (x86)\SpeedFan\speedfan.exe"
Also affected, pubg in my case. casued a number of crashes because it also disabled any temp warning i had configured in speedfan, will be using a second app for that now. that being said isn't there a way to maybe protect Speed fan driver from being manipulated? is there any hope that Almico might come to the rescue? And how do I use devcon? Unfortunately, I do not know how Devon is working, is not another solution? Hi guys I also have this problem. I was playing fortnite and looked over at my temps half an hour in and my I7 7700k nearly peaked at 90 degrees because of this. I have contacted Epic and Battle Eye and explained a bit from what i have learned about it and hopefully hear back from them soon. Same problem here. My son's PC almost fried, with GPU logged at 98C before it crashes and the whole system freezes. I'm using speedfan to control a water block, CPU, GPU and case fans. Once he runs Fortnite, the auto fan control doesn't work because the speedfan service (kernel mode driver) is blocked by BattlEye. The fans are always running too slow to stop the system from overheating. exactly what also happened to me, crashed a few times before noticing my fans weren't spinning up. luckily i run on air with a huge noctua heatsink, but i can imagine water systems are even more problematic. did you report this to battleye as well? I am now using a free trial of Argus Monitor as a temporary fix, which also lets you control case/cpu fans from a max temp of both gpu and cpu. Only other tool i could find apart from hardware solutions like corsair commander pro. I just mailed them through their contact form. It's a bit frightening having a software break other (innocent) softwares and put users' hardware at (potential) risk. I wonder if it only breaks memory writes or also access to other resources. Some hardware monitor devices do not require memory writes. From one of the pictures uploaded here, I see that even CPU temperatures are not available. Since those should be read using MSRs, I assume they are completely blocking my (signed) device driver. Switching to any other software to replace SpeedFan would just be a matter of time before it will be blocked too. I'm getting everyone I know and a few pepole on reddit to report this to Battleye, it's just ridiculous to block a software that has been around for so many years for that reason. Altrimenti qui c'è da incazzarsi. I figured they explicitly blocked the driver, thats what pisses me off the most. I agree that blocking other software is just a matter of time, but it is my only option at the moment, sorry for mentioning it here but i assume there are others who could use a temporary solution until this is resolved. Maybe this helps you work out a solution with battleye. To others, please also submit tickets to the developers that implemented battleye. battleye might not listen to you, but they will listen to their paying customers (the game devs). From what I can tell, they stop the SpeedFan service and somehow block it from running again. Using "sc start speedfan" results in an access denied (5) message while BE is running. Closing the UI, manually starting the service and restarting the UI, everything works as normal again (Once BE has stopped). Presumably you could modify the driver to restrict what kinds of accesses it can do in a way that would prevent abusing it for cheat software. Do you have some new information ? Will the author of Speedfanu do the new version? where will this bug be fixed? I think it only breaks memory writes. While battleye is running i am still able to read the temperatures of my hard disk drives with your software. "BattlEye is blocking certain software that is using kernel drivers which contain known security issues that can be exploited by cheats. ..."
With only access to physical memory we are able to find an EPROCESS structure by "bruteforcing" or iterating, if you will, over blocks of memory labeled with a pooltag. Pooltags with "Proc" are possible EPROCESS structures of different processes." And can this solution be solved? For example, Speedfan updates? If Alfredo fixes the vulnerability I'm pretty sure that Battleye will stop blocking new versions of the driver. We don't need any new features added, we just want to be able to use speedfan again. If you need anything tested, gimme a shout. Speedfan is one of the most important thing on my pc. I repel my new pc purchase cause of speedfan. Pls try to fix the exploit. we need this tool so much. In the meantime it's possible to restart the speedfan driver using the following commands in powershell/cmd run with admin. This way you can set the fan speeds before you start a game then resume automatic fan control afterwards. Put it in a batch script to make things easier. How does it look from speedfan? Will it be a new version? That's the only workaround that's working for me, thanks! However I have to do it manually, the batch script I wrote is not working, do you mind sharing yours with me? Paste into notepad then save as SpeedFanFix.bat or whatever you want to name it as long as it's a .bat file. start "" "C:\Program Files (x86)\SpeedFan\speedfan.exe"
You have to run the .bat file as admin. Unfortunately I'm not aware of any way to modify the speeds or settings of speedfan from the command line so you still have to set your speeds before and after playing a battleye game. One alternative would be to change the "set fan speeds to 100% on exit" option of speed fan to "set all fans to smartfan bios control on exit". Or allow some command line argument from speed fan that can do this. I think speedfan needs this option anyway. I am very disappointed with the incompatibility of PUBG and SpeedFan. The only solution is to uninstall SpeedFan. Fortunately, in less than an hour searching the internet I found the solution with Argus Monitor. Argus Monitor is shareware for 30 days but at the end of the trial period, Argus keeps running even though a registration reminder message is displayed. With Argus Monitor I can control the GPU fan (although I have set it by default), the CPU fan (also by BIOS default) and the best thing is that I can control the fans of the system by means of graphics associated to several sensors at the same time GPU and CPU temperature. It is perfect. In addition Argus Monitor shows many more graphs and configurations than SpeedFan. Also Argus does not give errors like in the speeds of the fans. SpeedFan showed me bad speeds of the type 65535 RPM. Argus Monitor is updated every so often and constantly adds new functionalities and new motherboard chips. It has even more functions than SpeedFan. With Argus I can control the CPU, GPU and System fans and put them in 3 modes: by default (BIOS), manually fixed or by software control (with dot graph). It's excellent. Nice, I am using this and its quite nice so far thanks, although what alfredo said above "Switching to any other software to replace SpeedFan would just be a matter of time before it will be blocked too" and the continuation to still able to use after 30 days does concern me however this is a rather nice replacement, especially from crappy bios fan curves that I was using as a fix. Thanks heaps for this! Argus has been here for a long time ... Speedfan is much better, it offers more features ... I hope Alfredo will repair it. I also hope it is fixed, no doubt! but in the meantime the argus works without getting cucked by battleye and using useless bios settings/fan curves or waiting for a uncertain fix. At least for now anyway. I wondered why my CPU & GPU temps were much higher in Rainbow Six ... now I understand BattleEye crippled my beloved SpeedFan. I really hope a solution comes up soon. Has anyone heard any updates on this? I haven't been able to play a battleye game since. Speedfan is far more important to me then the games that use battleye, but it would be really nice to play them again. @alfredo Can you hit us with an update? Nope, I gave up and run argus monitor now, I even paid for a liscence i liked it that much and its cheap af. I just played Fortnite after last update of the game and Speedfan worked fine! Sadly it is still broken in Rainbow Six Siege. Hopefully SpeedFan gets an update since Argus Monitor keeps crashing for me and I don't believe there's any other options to control case fans via GPU temperatures. Argus Monitor does not fail. I like it more than Speedfan. In addition to Fornite, there are several games that are incompatible with Speedfan, such as PUBG (PLAYERUNKNOWN'S BATTLEGROUNDS) or Rainbow Six Siege. Ok well unfortunately Argus Monitor fails for me, it will randomly crash my PC no matter its configuration or version. An application completely crashing your system usually indicates a bigger issue with said system, it is probably smarter to troubleshoot that issue than to wait for speedfan to get fixed. I tried troubleshooting but couldn't figure it out. My PC has run fine for years and still does without Argus Monitor. If I ever need to reinstall Windows I'll try Argus again to see if it works. Last post about Argus Monitor. I backed up a system image, formatted, clean installed Windows, and Argus Monitor still crashes my PC. More accurately it completely locks up my PC. I used Speedfan until about 2 months ago it started to get blocked with the games. I had to load Speedfan with a delay in the boot so that windows were not blocked. Now I use Argus Monitor and I also have to delay its startup until Windows loads completely. Well, this was quite frustrating. Came over to comment that speedfan was not detecting my chipset temp readings and fan speed controls, and playing PUBG would explain it. Next time you start Speedfan, all the readings should be good. From there, set all fans to 100% and carry on gaming. Hope you find a solution soon! This batch script has still been working for me, you might want to change yours to exit and restart speedfan to make things a little quicker. Either way beware that speedfan breaks as soon as Battleye starts and fan speeds will be stuck at whatever speed they were at when speedfan broke. Since I rarely play battleye games I've taken to switching to manual fan controls and bumping up the speeds before I start a game. That works perfect for me aswell Gractus. Anyway, there was another update in Fortnite after my last message and Speedfan is working fine again. That's the only game I was having trouble with. Ohhh my mistake I saved it as a Powershell script where "sc" is aliased for "set-content". Fully qualified program name e.g. "sc.exe stop speedfan" works in such a context. I haven't had issues since installing the newest version and disabling everything but the driver and hwmon which are required for fan control. Not sure exactly what the issue was and crashes are too infrequent for me to bother trying to narrow it down more, all I know is its gone and I like the idea of as much stuff being disabled as possible anyway. I face the same issue. How can we solve it? I really admired your post, such great and useful information that you have mentioned here.